The story re-imagines the cast of the Fate/Zero as cute super-deformed characters who open a café, led by Saber as the manager. Note: This is just a reminder for the Type-Moon Fans that there is some short chibi spin-off of your favorite characters. This is a movie type, but I will consider it an anime special instead because of the 1 minute duration. 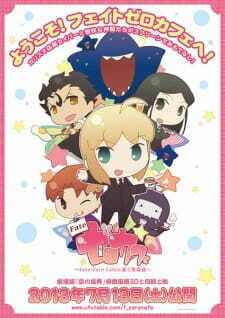 Fate/Zero café is a short animation portraying it character from the original fate/zero series into chibi form that is working in a café and that’s it. I can proudly say without a doubt that most anime fans won’t even know this anime exist. Usually only type-moon fans know this alternative version of fate/zero franchise. Art style is the only this I can rate in this 1 minute show which is ok for a 1 minute chibi show. I have nothing much to say about for the plot, character and music. Overall (1/10) I didn’t say the 1 minute art is bad but it just the most suitable rating for it. The 1 minute anime is available in Youtube if you want check it out, and if you want to add additional complete anime in your list feel free to add this anime for your list to grow. If you’re one of those people who want to watch every single media made by Type-Moon, I think you try it out. It’s 1 minute show and you will have nothing to lose anyway.